Iowa is a state in the Midwestern region of the United States of America. It became the 29th state when it joined the Union in 1846. Des Moines has been the capital since 1857. The state is named for the Ioway people, a Siouan tribe of Native Americans that formerly lived there. It is officially known as the "Hawkeye State" and unofficially as the "Tall Corn State." A north central state, it forms a bridge between the forests of the east and the high plains grasslands to the west. The Mississippi River forms its entire eastern border while the Missouri River forms much of its western border. 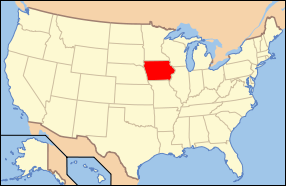 Iowa is bounded by Minnesota on the north, Wisconsin and Illinois on the east, Missouri on its south and Nebraska and South Dakota to its west. Ninety percent of the state's total land area is devoted to farming and a large part of its industry is directly related to agriculture, making it a major breadbasket of the nation and world. Thus its economic situation does not necessarily fall in line with the rest of the nation, and its politicians appear most prominently on the national scene when farm crises are major issues. The state gets considerable attention every four years because it holds the first presidential caucuses, gatherings of voters to select delegates to the state conventions. Along with the New Hampshire primary the following week, Iowa's caucuses have become the starting points for choosing the two major-party candidates for president. The national and international media give Iowa (and New Hampshire) much of the attention accorded the national candidate selection process, which gives Iowa voters enormous leverage. Those who enter the caucus race often expend enormous effort to reach voters in each of Iowa's 99 counties. Iowans are generally conservative and very much in a middle position geographically, economically, and politically, however they are also known to be independently-minded. The state is long known for excellence in education, ranking high in both expenditure per pupil and test results. A primarily rural state, its cultural life centers around sports and family life. The Mississippi River separates Iowa from Illinois and Wisconsin to form the eastern boundary of the state. The Missouri River on the western edge of the state forms the boundary for Nebraska. The exception is Carter Lake, an old oxbow lake of the Missouri River. Now urban, the state line runs through it. It thus sites in two cities (Omaha, Nebraska and Carter Lake, Iowa), in two states (Nebraska and Iowa), and in two counties (Douglas, NE and Pottawattamie IA). The Big Sioux River in the northwest corner of the state forms the north/south boundary with South Dakota. To the north lies Minnesota and to the south lies Missouri. 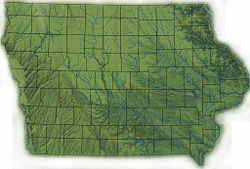 A number of rivers bisect the state, including the Des Moines, Iowa's longest at 485 miles (780 km). There are 31 natural lakes in the state, most formed by glaciers. These include Spirit Lake, West Okoboji Lake, and East Okoboji Lake in northwest Iowa. To the east lies Clear Lake. Man-made lakes include Lake Odessa, Saylorville Lake, Lake Red Rock, Coralville Reservoir, Lake MacBride and Rathbun Reservoir. Iowa's natural vegetation is the tall grass prairie and savanna, while the topography of the state is gently rolling plains left by retreating glaciers. Loess hills (deposits of wind-blown soil) lie along the western border of the state, some of which are several hundred feet thick. China is the only other place with such large deposits of loess. In southern Iowa, the glaciers deposited till, a mixture of soil and rocks. In central Iowa, melting glaciers left thick layers of rocky material called drift, which settled to create hollows that filled with water and eventually became swamps and lakes. This region is known as the Drift Plains and is excellent for growing crops. In the northeast, along the Mississippi River, is a section of the Driftless Zone, which in Iowa consists of low rugged hills covered with conifers—a landscape not usually associated with this state. The point of lowest elevation is Keokuk in southeastern Iowa, at 480 feet (146 m). The highest elevation, at 1,670 feet (509 m), is Hawkeye Point, located in northwestern Iowa. The mean elevation of the state is 1,099 feet (335 m). Considering the size of the state at 56,271 square miles (145,743 km²), there is very little elevation difference. Iowa has 99 counties. 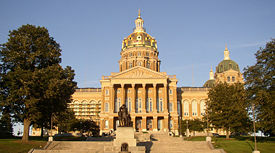 The state capital, Des Moines, is located in Polk County. Iowa has the highest average radon concentrations in the nation due to significant glaciation that ground the granitic rocks from the Canadian Shield and deposited it as soils making up the rich Iowa farmland. Many cities within the state, such as Iowa City, have passed requirements for radon-resistant construction in all new homes. Iowa, like most of the Midwest, has a humid continental climate throughout the state, with extremes of both heat and cold. The average annual temperature at Des Moines is 50 °F (10 °C); for some locations in the north the figure is under 45 °F (8 °C), while Keokuk, on the Mississippi River, averages 52 °F (12 °C). Winters are brisk and snowfall is common. Spring ushers in the beginning of the severe weather season. Iowa averages about 50 days of thunderstorm activity per year. Tornadoes are common during the spring and summer months, with an average of 37 in a year. Iowa averages about 32 inches (81 cm) of rain annually. The Iowa summers are known for heat and humidity, with daytime temperatures often near 90 °F (32 °C) and sometimes exceeding 100 °F (38 °C). Iowa was mostly a prairie before settlers arrived, and lacked heavy forestation. Oak, hickory, walnut, and elm trees are found in the river valleys, and in the Driftless Zone white pine, balsam firs, and cedars cover the hillsides. The buffalo that once roamed the state's vast grasslands are mostly gone. The mammals that populate the state today include white-tailed deer, rabbits, foxes, squirrels, and raccoons. Pheasants, quail, and partridges thrive in the fields. When the first Native Americans arrived in what is now Iowa more than 13,000 years ago, they were hunters and gatherers living in a Pleistocene glacial landscape. The first people to travel through Iowa were most likely the Paleo-Indians. These ancient people traveled through Iowa near the end of the ice age, from 9500 B.C.E. to 7500 B.C.E., hunting animals such as the bison, mammoth, and mastodon. By the time European explorers visited Iowa, Native Americans were largely settled farmers with complex economic, social, and political systems. This transformation happened gradually. During the Archaic period (10,500-2,800 years ago) Native Americans adapted to local environments and ecosystems, slowly becoming more sedentary as populations increased. More than 3,000 years ago, during the Late Archaic period, Indians in Iowa began utilizing domesticated plants. The subsequent Woodland period saw an increase of the reliance on agriculture and social complexity, with increased use of mounds, ceramics, and specialized subsistence. During the Late Prehistoric period (beginning about 900 C.E.) increased use of maize and social changes led to social flourishing and nucleated settlements. Today, Effigy Mounds National Monument in northeastern Iowa has the largest assemblage of animal-shaped prehistoric mounds in the world. Approximately seventeen different Indian tribes had resided here at various times, including the Ioway, Sauk, Mesquaki (called Fox in many sources), Sioux, Potawatomi, Oto, and Missouri. Sauk and Mesquaki as painted by Karl Bodmer ca 1840-1843. The two related tribes have since joined together and are known today as the Sac and Fox Nation. In 1673, the Frenchmen Jacques Marquette and Louis Jolliet visited Iowa. The French then considered the region to be part of their American possession of Louisiana, or New France. In the Treaty of Paris (1763), France ceded Louisiana to Spain; in a secret treaty of 1800, the Spanish returned Louisiana to France; in 1803, the French sold Louisiana to the United States. The Potawatomi, Oto, and Missouri Indians had left Iowa by 1830, while the Sauk and Mesquaki remained in the Iowa region until 1845. The Santee Band of the Sioux was the last to negotiate a treaty with the federal government in 1851. In 1829, the federal government informed the Sauk and Mesquaki tribes that they must leave their villages in western Illinois and move across the Mississippi River into the Iowa region. The move was made, but not without violence. As punishment, the federal government required the Sauk and Mesquaki to relinquish some of their land in eastern Iowa. Today, Iowa is still home to the Mesquaki. After most Sauk and Mesquaki had been removed from the state, some Mesquaki tribal members, along with a few Sauk, returned to hunt and fish in eastern Iowa. The Indians then approached the governor with the request that they be allowed to purchase back some of their original land. They eventually bought back approximately 3,200 acres (13 km²). Motto: "Our liberties we prize and our rights we will maintain"
The first settlers officially moved to Iowa in June 1833. On December 28, 1846, Iowa became the 29th state in the Union. Iowa supported the Union during the Civil War, voting heavily for Abraham Lincoln, though there was a strong antiwar movement among settlers of southern origin and among Catholics. There were no battles in the state, but Iowa sent large supplies of food to the armies and the eastern cities. Following the Civil War, Iowa's population continued to grow dramatically, from 674,913 people in 1860 to 1,194,020 by 1870. In 1917, the United States entered World War I and farmers as well as all Iowans experienced a wartime economy. For farmers, the change was significant. From the beginning of the war in 1914, Iowa farmers experienced economic prosperity. In the economic sector, Iowa also had undergone considerable change. Beginning with the first farm-related industries developed in the 1870s, Iowa has experienced a gradual increase in the number of business and manufacturing operations. The period since World War II has witnessed a particular increase in manufacturing operations. While agriculture continues to be the state's dominant industry, Iowans also produce a wide variety of products, including refrigerators, washing machines, farm implements, and food products that are shipped around the world. Iowa's gross domestic product in 2005 was about $124 billion. Its gross state product for 2005 was $113.5 billion. Its per capita income for 2006 was $23,340. The role of agriculture in Iowa's economy can be measured in multiple ways, but its total impact, including agriculture-affiliated businesses, has been measured as 16.4 percent (in terms of value added) and 24.3 percent (in terms of total output). This is lower than the economic impact in Iowa of non-farm manufacturing, which accounts for 22.4 percent of total value added and 26.5 percent of total output. Iowa's main agricultural outputs are hogs, corn, soybeans, oats, cattle, eggs, and dairy products. Its industrial outputs are food processing, machinery, electric equipment, chemical products, publishing, and primary metals. Iowa produces the nation's largest amount of ethanol. Des Moines also serves as a center for the insurance industry. Gambling casinos are now one of Iowa's principal sources of revenue, contributing over $1 billion to the state's economy in the form of gaming taxes, purchases from Iowa vendors, salaries, and charitable donations. Northwest Iowa is home to some of the largest concentrations of wind turbine farms in the world. Iowa is the headquarters for seven of the top 1,000 companies for revenue. They include Principal Financial, Rockwell Collins, Casey's General Stores, and HNI Corporation (a furniture manufacturer). The Iowa State Capitol, featuring its golden dome. Des Moines is the capital of and the most populous city in Iowa. Des Moines was founded in May 1843 when Captain James Allen built a fort on the site where the Des Moines and Raccoon Rivers merge. Settlers came and lived near the fort, and on May 25, 1846, the settlement became the seat of Polk County. On September 22, 1851, it was incorporated as a city with its own charter approved in a vote on October 18. In 1857, the name Fort Des Moines was shortened to Des Moines alone and the state capital was moved from Iowa City. By 1900, Des Moines was Iowa's largest city with a population of 62,139. In 2007 its population was 197,000. The Iowa governor is elected to a four-year term and can serve an unlimited number of terms. The state legislature, known as the General Assembly, consists of a senate of 50 members and a house of representatives of 100 members. Senators serve four-year terms; representatives serve two-year terms. The state supreme court, whose members are appointed by th governor, is the highest judicial body. Iowa also has a state court of appeals. Ruins of historic Fort Atkinson in northeast Iowa, built to serve the Winnebago during their removal from Wisconsin. The fort was abandoned in 1849 after the tribe was removed from Iowa to Minnesota and South Dakota. In Iowa, the term "political party" refers to political organizations that have received 2 percent or more of the votes cast for president or governor in the "last preceding general election". Iowa recognizes two political parties - the Republican Party and the Democratic Party. Third parties, officially termed "nonparty political organizations," can appear on the ballot as well—five of these have had candidates on the ballot in Iowa since 2004 for various positions: The Constitution Party, the Iowa Green Party, the Libertarian Party, the Pirate Party, and the Socialist Workers Party. Iowa is currently listed as a swing state in national politics. From 1968 to 1988, it voted Republican in the presidential election, voting for Richard Nixon in 1968 and 1972, Gerald Ford in 1976, and Ronald Reagan in 1980 and 1984. However, in 1988, Democratic candidate Michael Dukakis won the state, beating Republican candidate George H. W. Bush by a surprisingly large margin in that state and winning in several traditionally Republican counties. The state subsequently voted Democratic in succeeding elections, voting for Bill Clinton in 1992 and 1996, and Democrat Al Gore in 2000. In 2008, Barack Obama won the state by 10 percentage points. In the January 4, 2008, national primaries for president of the United States, Iowa voters selected the Democratic Party nomination contender U.S. Senator Barack Obama of Illinois as the winner. As the Iowa caucus is believed to be the first crucial test for the rest of the campaign, it is considered a key stepping stone on the path to the White House. It helped catapult Senator Obama's quest for winning caucuses and primaries throughout the rest of the country, ultimately resulting in him securing the nomination and being elected the 44th president of the United States. Iowa takes pride in its education system. The graduation rate for high school seniors has gradually increased to 90.8 percent in 2006. The state has the third highest graduation rate in the nation. Iowa continually ranks in the top three for ACT and SAT scores. Iowa has 365 school districts, and has the twelfth best student-to-teacher ratio, with 13.8 students per teacher. Teachers' pay, however, is ranked forty-second, with the average salary in 2004-2005 being $39,284. Iowa has three state universities—the University of Iowa, Iowa State University, and the University of Northern Iowa—and many private colleges and universities and community colleges. As of 2007, Iowa had an estimated population of 2,988,046, which was an increase of 15,480, or 0.5 percent, from the prior year and an increase of 61,722 or 2.1 percent, since the year 2000. This includes a natural increase since the last census of 53,706 people (that is 197,163 births minus 143,457 deaths) and a decrease due to net migration of 11,754 people out of the state. Immigration from outside the United States resulted in a net increase of 29,386 people, while migration within the country produced a net loss of 41,140 people. Of Iowa's population, 6.1 percent were reported as under the age of five, 22.6 percent under 18, and 14.7 percent were 65 or older. Males made up approximately 49.2 percent of the population. The population density of the state is 52.7 people per square mile. Iowa's population includes about 97,000 foreign-born (3.3 percent). Iowans are mostly of Western European descent. The five largest ancestry groups in Iowa are: German (35.7 percent), Irish (13.5 percent), English (9.5 percent), American (6.6 percent), and Norwegian (5.7 percent). The racial makeup of the state is 91.0 percent white (non-Hispanic), 3.8 percent Hispanic, 2.5 percent black, 1.6 percent Asian, and 0.4 percent Native American. About 1 percent of respondents report two or more races. A 2001 survey found that 52 percent of Iowans are Protestant, while 23 percent are Roman Catholic, and other religion made up 6 percent. Another 13 percent responded as non-religious, and 5 percent did not answer. The largest Protestant denominations by number of adherents are the Evangelical Lutheran Church in America with 268,543; and the United Methodist Church with 248,211. Iowa has been the birthplace of one president, Herbert Hoover, and one vice-president, Henry A. Wallace. Among the Nobel Prize winners born in Iowa are Norman Borlaug, Nobel Peace Prize; Alan J. Heeger, Nobel Prize in Chemistry; and Stanley B. Prusiner, Nobel Prize in Physiology or Medicine. Olympic gymnastics gold medal winner Shawn Johnson was born in Iowa. Iowa, in common with other Midwestern states (especially Kansas, Nebraska, and North and South Dakota), is feeling the brunt of rural flight, although Iowa has been gaining population since approximately 1990. Of the total number of cities in those states, 89 percent have fewer than 3,000 people; hundreds have fewer than 1,000. Between 1996 and 2004, almost half a million people, nearly half with college degrees, left the five states, and headed for major population centers like Minneapolis and Chicago. Iowa had begun losing its deep topsoil to wind and water erosion but has initiated a program that encourages farmers to restore their land. The state also has passed laws to preserve groundwater and promoted research to reduce the use of chemicals on crops. Flooding along the Mississippi has taken its toll in recent years. Iowa's Department of Natural Resources reported in June 2008 that while much of the agricultural land in Iowa had suffered severe erosion due to flooding, the amount of damage was reduced on farms that had added conservation practices to their land. ↑ State Symbols. Iowa Department of Economic Development. Retrieved September 9, 2011. ↑ Carter Lake Preservation Society, Two cities, two counties, two states and ONE LAKE! Retrieved November 19, 2008. ↑ United States Geological Survey, July 1999, Geology of the Loess Hills, Iowa. Retrieved November 19, 2008. ↑ University of Iowa College of Public Health, The Iowa Radon Lung Cancer Study. Retrieved November 19, 2008. ↑ National Weather Service Southern Region Headquarters, US Thunderstorm distribution. Retrieved November 19, 2008. ↑ National Climate Data Center, Mean Annual Average Number of Tornadoes 1953–2004. Retrieved November 19, 2008. ↑ Iowa State University, Gross domestic product by sector and state. Regional Capacity Analysis Program. Retrieved November 19, 2008. ↑ 11.0 11.1 State Library of Iowa, Iowa Quick Facts. Retrieved November 19, 2008. ↑ David A. Swenson and Liesl Eathington, Multiple Measures of the Role of Agriculture in Iowa's Economy, University of Connecticut. Retrieved November 19, 2008. ↑ Elections Division, Iowa Secretary of State, Forming a New Political Party in Iowa. Retrieved November 19, 2008. ↑ Iowa Secretary of State, Official Results Report—Statewide: 2006 General Election. Retrieved November 19, 2008. ↑ Iowa Department of Education, Quick Facts about Iowa Schools. Retrieved November 19, 2008. ↑ National Education Association, Education Stats. Retrieved November 19, 2008. ↑ 17.0 17.1 17.2 U.S. Census Bureau, Iowa Quick Facts. Retrieved November 19, 2008. ↑ The Graduate Center of the City University of New York, American Religious Identification Survey 2001. Retrieved November 19, 2008. ↑ The Association of Religion Data Archives, State Membership Report—Iowa. Retrieved November 19, 2008. Energy Information Administration. Iowa State Energy Profiles. Retrieved November 19, 2008. Hintz, Martin. 2000. Iowa. New York: Children's Press. ISBN 051621070X. LaDoux, Rita C. 2002. Iowa. Minneapolis, MN: Lerner Publications. ISBN 0822540789. U.S. Census Bureau. Iowa Quick Facts. Retrieved November 19, 2008. Iowa State Databases—Annotated list of searchable databases produced by Iowa state agencies and compiled by the Government Documents Roundtable of the American Library Association. This page was last modified on 5 March 2018, at 23:17.